The microformats.org community recently celebrated its 5th birthday – five plus years of openly researching, creating, and iterating on web standards to express common semantics designed for humans first, machines second. I’m pretty happy with this added functionality so I intend to explore using hCards in other parts of our apps where it makes sense. Thanks to Jeremy Keith for making the request and following-up with 37 Signals. That’s another 14+ million hCards (figure from WordPress.com), each representing an individual blogger on the public web. 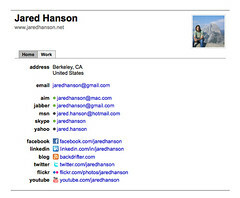 Finally, just before microformats.org’s 5th birthday on this past June 20th, developers of BrightKite informed us that they’ve fully implemented hCard on all of their 5.5 million registered user profiles and 16.5 million venue pages – another 22 million new hCards. Thanks for the birthday present BrightKite! All of these deployments come from the powerful combination of: 1. microformats ease-of-authoring (the easiest way to semantically markup people, venues, etc. in HTML), and 2. the fact that search engines like Yahoo and Google index microformats and make them visible in their user interfaces. In May of 2009 Google launched Rich Snippets with support for microformats and RDFa, with a set of content partners like Yelp who all chose to use microformats to produce rich snippets in Google search results. Starting with support for hCard, hReview, hReview-aggregate, and hProduct, over the past year, Google added support for hCalendar and hRecipe as well. For all of these, Google provided side-by-side examples for each snippet type in multiple formats (microformats, RDFa, microdata), which in many ways has helped to demonstrate how much simpler/easier microformats are in many respects (and some of the promise that microdata shows for more general extensibility). As recently reported by ReadWriteWeb, Google themselves reported at the Semantic Technologies conference that when Google finds data for rich snippets on pages, 94% of the time that data for rich snippets is marked up with microformats (40,091 vs. 2,514, conservatively assuming none of of those pages contain both, if they did, the 94% number would be even higher). Photo credit: Read Write Web: Google’s Semantic Web Push: Rich Snippets Usage Growing. ~30x more person snippets use hCard (33,675 vs. 1,160). This is no surprise, as The State of Web Development 2010 survey showed nearly an order of magnitude gap, that is far more (6x more) web developers use microformats in their day to day work (34.52% use microformats vs 5.63% use RDFa, per the survey). Given many more web developers are using microformats, it’s not surprising that Google is finding more microformats than alternatives. What is interesting though is that while 6x more developers use microformats, Google is finding 16x more microformats for rich snippets than alternatives. One could conclude from these two numbers that developers using microformats are 2-3 times more net productive in terms of number of pages produced with rich snippets. This net productivity could be because microformats are easier (take less time) to author, and possibly that microformats are easier to get right, and thus have Google recognize them, as compared to alternatives. Still, we can do even better than that. And no, I’m not just talking about going from 94% to 99+%. The Google presentation slide noted that the results were out of one million web pages sampled from the Internet . Out of that, only ~40,000 had microformats. Given that nearly every web page mentions people, organizations, events, or some other popular microformat, that number should be much higher. Thus there is much room for us to improve, and in particular, based on feedback, from Google, Yahoo, from numerous smaller companies and independent web developers, we can and should make microformats even simpler. Simpler to write, easier to get right, and ideally, even more micro – less code, less page weight. Starting with a few ideas brainstormed a couple of months ago, there’s now a few folks working on a “microformats 2.0″ to achieve these goals. Do you have feedback or ideas about how microformats could be made even simpler and easier for authors? Please add your thoughts to the “microformats-made-simpler” wiki page. Have you implemented hCard profiles on your site? Add your site to the hCard supporting user profiles page. Thanks to all of the hard work and contributions by everyone in the microformats community for an excellent fifth year of microformats.org. Here’s looking forward to even more microformats accomplishments in our sixth year. Madgex‘s brand new hResume importer powers the Guardian UK‘s recently launched Guardian Jobs CV Match service. The site YIID (Your Internet Identity) now also supports importing hResumes. Open source parsing libraries continue being developed for numerous languages. The latest, as noted by Tom Morris on the parsers page, is the Java library org.microformats.hCard written by Reinier Zwitserloot. Got a beautiful hCard you want noticed? Add it to the hCard examples in the wild wiki page. It’s important to highlight individual hCards like the above, as continued proof that people do write web pages, HTML, markup in general, by hand. Even when such pages are generated from a database used fill out an HTML template, a person still writes the template by hand. 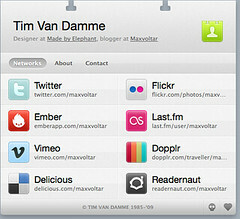 And it’s important to highlight those that update templates as well to support microformats. The list of social network sites with hCard profiles continues to grow, this time with a big addition: MySpace. As of about a month ago, all new MySpace profiles, and all current users who upgrade their profile to version 2.0, automatically get hCard support, as confirmed by MySpace’s platform developers. Behind all these new microformats implementations and sites is a vibrant and active community, not just here on microformats.org, but across the web as a whole, and across web development communities as well. The standards-championing Dev Opera community recently published a wonderful article on Styling and extracting hCalendar by Christopher Schmitt, and updated it with use of the value class pattern for better accessibility. Safari Books Online and New Riders have made published a video, Designing with Microformats for a Beautiful Web , by well known web designer Andy Clarke. And finally, last but not least, this past month saw the resolution of all outstanding issues on both hCard and hCalendar, paving the way for updates to the specs, FAQs, and 1.0.1 drafts, incorporating important errata, updates, and brainstormed improvements. The microformats community was quite busy this summer, and September brought a lot of forward progress. October is shaping up to be even more impressive. For more microformats updates as they happen, be sure to subscribe to the microformats discuss mailing list and the @microformats Twitter. The recent microformats momentum from the introduction of the value-class-pattern and Google & Yelp’s support continues with the launch of Yahoo Placemaker™, an update to Optimus, the open source microformats validator, and a browser button that makes it easy to one-click validate your microformats. Congratulations to Yahoo on their recent launch of Yahoo Placemaker™ Beta! Yahoo Placemaker extracts locations marked up with the geo and adr microformats from web pages. See the Yahoo Placemaker documentation for details. Optimus, the open source microformats transformer that also happens to do an excellent job as a validator, has been updated to version 0.8. Optimus v0.8 supports the recently developed value-class-pattern‘s “value-title” functionality. Optimus now also has its own twitter account that you can follow, @optimusmf. For microupdates on microformats in general, follow the @microformats twitter. In most browsers, simply drag and drop the above “> Optimus microformats validator” link to your “Links Toolbar” / “Bookmarks Bar” / “Favorites Bar”. The Technorati Browser Buttons page has good additional installation instructions for browser buttons for various browsers. Then go to any of your pages with microformats, click the newly created “> Optimus microformats validator” button in your browser toolbar, and read the validator report for suggested fixes and improvements to your microformats markup. With both Google and Yahoo now indexing microformats like hCard and hReview, use the Optimus microformats validator to debug your microformats. Additional tools can be found on the debugging tools page. *Browser buttons were originally called bookmarklets or favelets. However, Google’s documentation calls them “Browser Buttons” which sounds much friendlier and free of tech-jargon origins. ‘This Week in Microformats’ is a summary of notable microformats activity from the mailing lists, wiki, events and the wider web. Din Neville has been working hard this week, updating the Russian translation of the wiki. Thank you, Din. datetime-design-pattern contains documentation and discussion of alternative patterns to represent dates and times. The parsers page has fallen a little out of date. If you’d like to help update it with links to current available parsers, please help! There’s a new html5 page to track changes in HTML5 which will affect microformats (both positive and negative). Not that these issues don’t affect parsing now, and won’t do until HTML5 is stable. 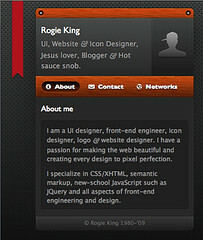 David Singleton’s XFN Life Stream tool shows distributed social networking powered by microformats. Cognition 0.1 alpha 10 was released. Yahoo! Search Monkey has a suggestion board for requesting new features for their microformats enhancements to Search. Mail Chimp have started adding hCard mark-up in the footer of HTML emails sent through their service. An interesting experiment with microformats outside the browser. Ueli Weiss has written a great hCard-based profile importer, allowing you to pre-fill sign up forms with hCard info, given just a URL. There’s a demo available, too. Kornel Lesinski has released an hCard conformance checker (validator). See using microformats.org. It was microformats third birthday on June 20th! To contribute to the next issue, please edit the wiki page. Thanks! This Week in Microformats’ is a summary of notable microformats activity from the mailing lists, wiki, events and the wider web. We’ve documented machine data usage in microformats (date and time formats, geographic locations, keywords in certain formats). The page is a quick reference for all the formats we specify, the all the current supported methods on how to embed data alongside your own text, in an HTML valid manner. Discussion off the back of the BBC’s request for help learning about screen reader usage. The BBC are asking for help in finding out how people use screen reader applications to read web pages aloud; critically, whether they have them set to always read the title attribute of abbreviation elements. Please give them some feedback if you can, it helps improve the information we have to work with on future patterns. Hi5 have added hCard and XFN support to their friends lists. Mahalo have added microformats to their search result pages. Toluu have added an hCard-based profile import function to their sign-up process. This Tuesday, 27th May, the Microformats vEvent takes place in London.